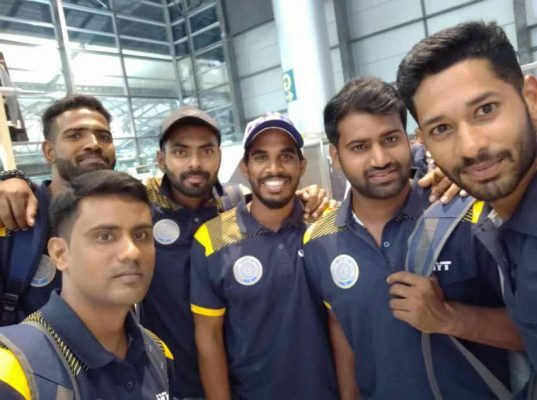 The Hyderabad team, led by Akshath Reddy, finally flying off to Delhi for the Vijay Hazare one-day tournament on Tuesday. Hyderabad: The Hyderabad team heaved a sigh of relief when they got the nod to play in the Vijay Hazare one-day tournament that gets underway in three cities from Wednesday. After four days of suspense, the High Court appointed Justice Anil Dave’s Committee of Administrators (CoA) sent the letter of approval to the Hyderabad Cricket Association (HCA), who in turn, sent Justice Dave’s mail to Saba Karim, General Manager (cricket operations) on Tuesday morning. This paper had reported that the Hyderabad team would get the green signal on Tuesday and the team will participate in the one-day tournament. The Akshath Reddy-led team left for New Delhi late in the evening. The Hyderabad team is placed in Group B along with Madhya Pradesh, Delhi, Saurashtra, Andhra, Uttar Pradesh, Chattisgarh, Kerala and Odisha. They play the first match against Madhya Pradesh at Palam Grounds on Wednesday. Narsing Rao will be the manager of the team. The three-member CoA team of Justice Dave (retd), Justice GV Seethapathy (retd) and Ratnakar Shetty need to be appreciated for clearing the team even though there was some technical problem as the team was picked by the Steering Committee-appointed selectors. The CoA was in dilemma over the rule book. The selectors were picked before the High Court judgement and it did not have the approval of annual general body meeting. Keeping the players’ future in mind, the CoA took this brave decision to allow the Hyderabad team to participate in the tournament. There was frenetic activity in the morning. A few players had a final session in the morning at Uppal Stadium and by the time they finished the nets session, they got the news they would after all participate in the Vijay Hazare tournament which is of special significance this year because of the 2019 World Cup that is few months away. Thanks to the bitter feud between the Apex Council members which finally led to the intervention of the High Court in appointing CoA, this could be the worst-ever preparations for the Hyderabad team to any new season. Even as other teams reached their respective venues two or three days in advance, Hyderabad will reach Delhi late in the night and straightaway play their first match against MP on Wednesday morning at 9 am. Arjun Yadav, the newly appointed senior coach by the steering committee of Mohammad Azharuddin and VVS Laxman, expressed his happiness that Hyderabad will finally get to play in the tournament. “It has come as a big relief. The players are ready for the challenge,” he said.